Remember when we told you about skip swimming pools? Well we’ve discovered something even better: a wedding skip. 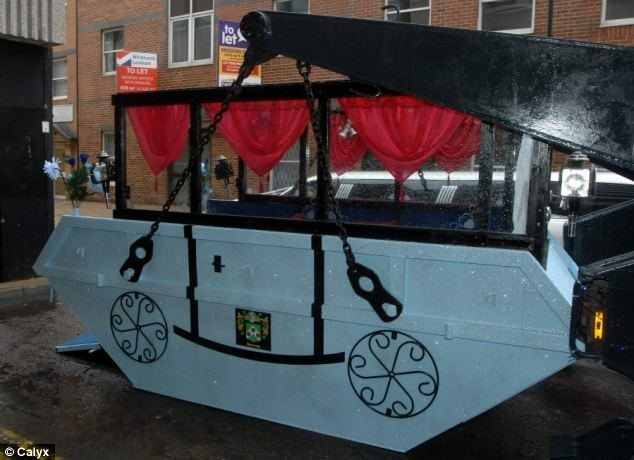 That’s right – someone has converted a skip into a wedding carriage. It’s hardly the most glamourous of transportation, but Cinderella did travel via glorified pumpkin. Whatever floats your boat, after all. It was transformed by the groom, Nick Kearns, who had promised it to his future wife. It took him two weeks to put together, and they made sure it complied with the health and safety regulations of the road. I wonder what they Googled to check that! 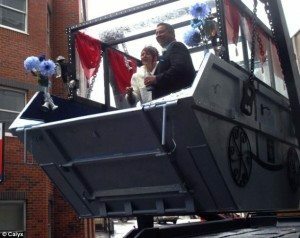 The skip took the couple to and from Swindon’s registry office, and was decorated with blue glitter, bells, lights, curtains and even had a roof. So as far as giant garbage bins go, it’s pretty snazzy. The bride, Noreen, said ‘He always calls me his princess and he wanted to make me a princess’s carriage out of a skip.’ And we’re pretty sure Cinderella said the exact same thing. If you’re looking for a skip then you’ve come to the right place. Here at Top Skips, we have a wide range of products for events, construction sites and private use. We have a full list of what you can put in a skip on our website. Want more information? Give our friendly and expert team a call on 0844 686 9342 today!